THE BAILY ULTIMATUM – PART 3: O.T.I. REGIME CHANGE UNIT – Alternate Comms. As TEAM UZUNOV has revealed, the U.S. State Department has officially claimed that its funding to NGOs and general activities of USAID in Macedonia are all above-board, both in public statements and official letters to legislators. Since Ambassador Baily did not respond to TEAM UZUNOV’s questions, we have to assume he shares that opinion. However, there is one lingering scandal that has been an open secret in Macedonia, discussed in the local media for over two years- though oddly enough, nowhere else in the world. This is in reference to USAID’s semi-secret ‘regime change’ unit, Office of Transition Initiatives (OTI), which was created by former President Clinton in the 1990s to give a ‘rapid reaction’ capacity to USAID activities. In reality, it is somewhat a combination between the Peace Corps and the CIA, and in Macedonia has come under severe ridicule while causing great stress among embassy bigwigs. A very similar thing happened in Macedonia, under the purview of Ambassador Baily. Given his failure to respond to TEAM UZUNOV’s questions, it is unclear who requested the mission- which was definitely not specified anywhere in the July 2015 Przino Agreement for reforms, signed by Macedonia’s four major political parties. 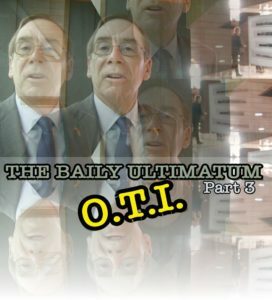 OTI was used in the Balkans before, such as to help take down Milosevic. 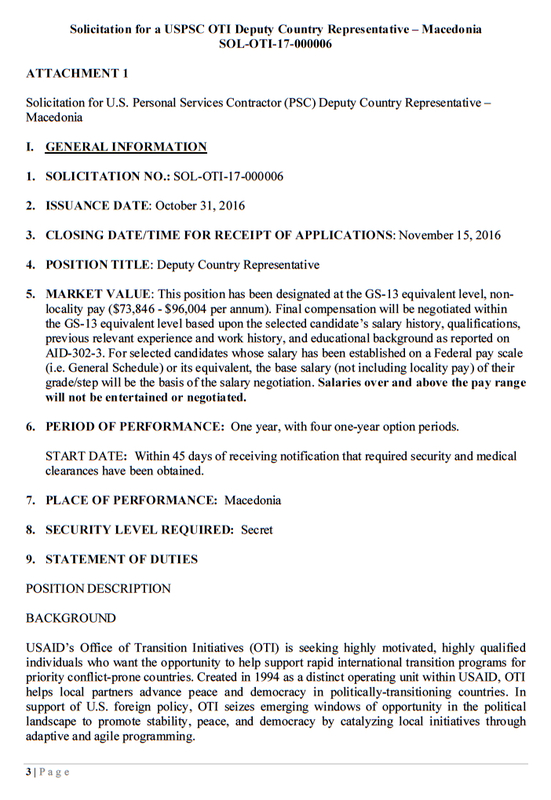 All that is known for sure is that by September of 2015, USAID in Washington DC was holding secretive job interviews for a mission in Macedonia. This would infer that the background plan for the program had been made earlier- possibly even before the controversial July Przino Agreement, which itself was signed only five months after tennis playing Ambassador Baily’s deployment to the Macedonian theatre. SECRET CLEARANCE NEEDED FOR AID WORK? – Handing out pens, brochures ? Unless of course it’s not aid work? 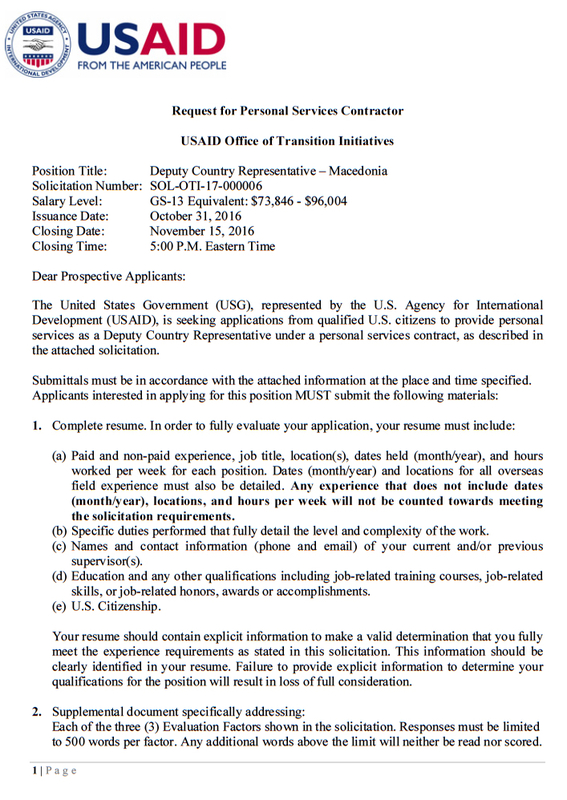 Although USAID has always claimed its programs for civil engagement, media and NGOs are benign and harmless one has to wonder why (according to an official job application form for the position), a Security Clearance-level Secret is required. 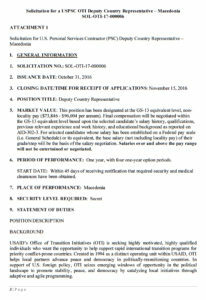 ( Request for Personal Services Contractor – see below). To cover its tracks locally, OTI contractors were hired through the Washington firm AECOM, given a separate address, and kept away from Baily and other prominent Embassy persons. 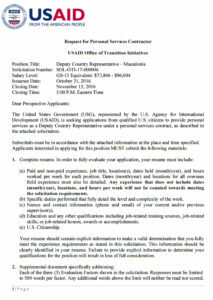 Even stranger, the USAID head in Macedonia (then, James Stein) sent official requests to the Ministry of Foreign Affairs for a Special Identity Card for OTI contractors, not the typical residency or work ID that most foreigners get. They do this, it is believed, to make sure OTI staff qualify for some kind of diplomatic immunity- even though they are private contractors and not diplomats. Although Macedonian government officials and intelligence services clearly knew all about the OTI’s activities in organising concerts, working on political radio shows, youth networking throughout the country, etc., they gave the operators a wide berth, fearing to upset their American overlords. Professionalising the Macedonia media environment. USAID/OTI supported the creation of political debate show “Only the Truth” as part of a wider media portfolio. The show presents civil dialogue and diverse viewpoints on critical issues affecting Macedonians. 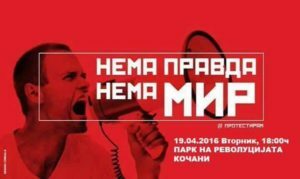 ”Only the Truth” has succeeded in presenting issues in a non-partisan way, changing perceptions of the media environment in Macedonia. Promoting citizen participation in public discourse. Activities such as “Transforming Public Spaces” use the arts to create social change by promoting discussions that encourage citizens to engage in positive actions in their communities. Supporting key institutions to implement critical reforms, consistent with EU standards. The Government of Macedonia, governed by a new coalition, is undertaking a bold and long-overdue set of legislative, policy and systemic reforms. USAID/OTI is providing assistance to reorganise, equip and enable key sectors of the Macedonian government, better positioning it to advance the democratic reform process. Despite these optimistic words, TEAM UZUNOV found that Macedonians themselves felt differently. During the 2016 period of peak activity/Colourful Revolution, a few journalists (most notably, Mirka Velinovska of the long-running newspaper Dnevnik) lampooned OTI and its activities. However, since SDSM took power, the long-running newspaper was shut down and no media criticism of the powerful American regime-change operation can be found. Velinovska lost valuable traction after becoming obsessed with the catchy phrase of The Umbrella (chadorot) to describe the US’s all encompassing reach in or cover of all aspects of life in Macedonia. This allowed any crackpot with a bizarre theory such as Freemasons etc to hitch their wagon onto Velinovska for better to worse. In private Macedonians have different opinions. One local academic denounced the OTI radio call-in show as “a total failure” and another local complained that its television program was “obviously political, favoring SDSM.” All of TEAM UZUNOV’s sources agree that the USAID program appeared to work in tandem with the same Soros-linked NGOs that roused attention from conservative lobbyists and the U.S. Congress in the first place.